There are three elegant en suite rooms from which to choose. All are furnished with antiques and amenities with guests’ every comfort in mind, and each has a distinctly different flavor. Your guest room awaits you with fresh flowers, fine linens, fluffy towels, and specially milled soaps. Each has cable TV with a DVD player, an am/fm clock radio, and a hair dryer. 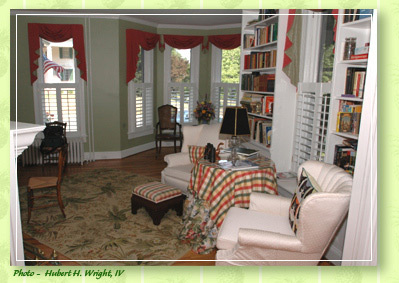 We offer free Wi Fi, and the Inn is centrally air conditioned. On the first floor, our spacious common rooms include a large living room with fireplace, a den/sitting room with fireplace, and a parlor with fireplace, a chess table, and books and games to lend. A full gourmet breakfast is served in our antique-filled dining room at a table set with fine china and silver. 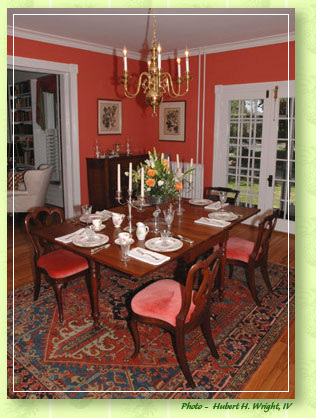 Here one can enjoy conversation and linger over breakfasts that are meant to be savored. Jen’s signature menus incorporate organically grown herbs and vegetables from the Inn garden as well as fresh produce from our local Farmers’ Market where we shop weekly from April through October. All breakfasts begin with juice, fresh fruit in season, and one of a variety of homemade baked goods. A hot entrée follows. For details on some of our great breakfasts, click here. In fair weather, guests can catch the River breeze on the north porch and enjoy a pitcher of lemonade accompanied by freshly baked cookies. Once the weather turns cold, guests can enjoy an English Cream Tea or a glass of wine, fireside, in any one of three common rooms. We invite you to experience, firsthand, our historic town and environs. Whether you are bikers, boaters, or birders, each season holds something special here on the Eastern Shore. Perhaps you would just enjoy a weekend of luxurious pampering. Whatever the reason, we hope you will spend your time with us at the Mill Street Inn where you will find splendid accommodations and a heaping dose of Eastern Shore hospitality. Our accommodations are not suitable for children. Sorry, no pets. We have two kitties who are confined to our personal apartment in consideration of guests who may be allergic, and we cannot assume responsibility for guests’ pets in the Inn. For the comfort of all our guests, we are a smoke-free inn.